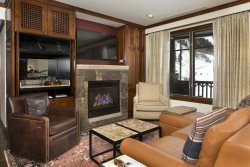 This top floor 2-bedroom, 2-bath deluxe townhouse features an open living area with vaulted ceilings and a stone fireplace, and is only three blocks from the Silver Queen Gondola and even closer to downtown Aspen. Unit amenities include upgraded bathrooms, a washer/dryer, dishwasher, and flatscreen TV in the main living area and both bedrooms. Complex amenities at the Old Hundred include free Aspen airport transfers, on-site free parking, free Wi-Fi.